May has gone by unbelievably quickly for me. I think I say that every month but this month has flown by. I’ve been really busy this month and barely made anything. Even my 5 year old noticed I hadn’t been sewing and suggested I stay at home to do some sewing whilst everyone else went out for a few hours! I really want to spend more time being creative and my heart just doesn’t seem to be in blogging at the moment. Perhaps after blogging for 10 years that’s not surprising so I’m hoping for some amazing inspiration when I go to Blogtacular next month. Right back at the beginning on the month I made the gorgeous felt birds from Mollie Makes. I love the free gifts which come with sewing magazines, in fact that’s probably what persuades me to buy them 🙂 However I rarely make the kits, or the patterns inside the magazines, but I knew I had to make these. 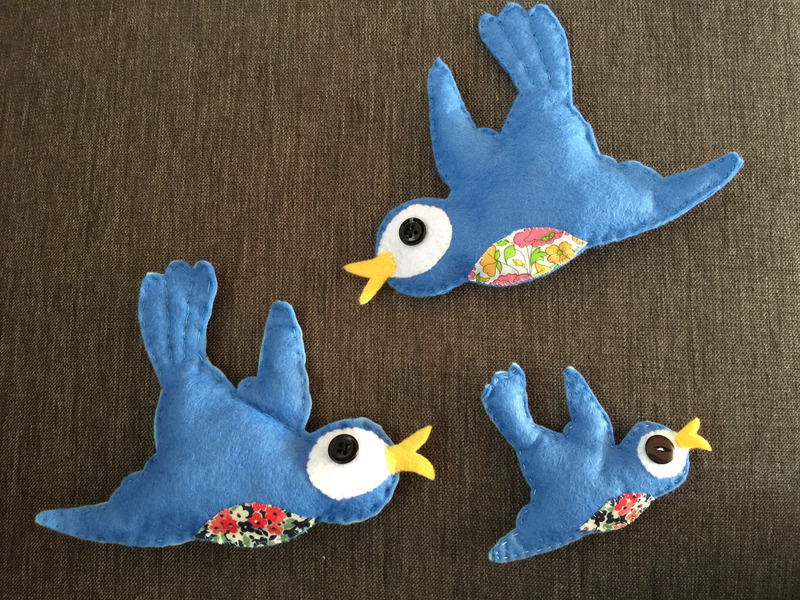 I made a garland of three felt birds by enlarging the pattern, then a smaller bird which I made into a brooch. I’ve started a new EPP patchwork chair cover for my daughters vintage Lloyd Loom chair. I chose a selection of nautical pinks from elephant in my handbag. I’ve also made a start on the Shipping forecast quilt which I’m really excited about, especially using the beautiful customisable fabrics from zazzle. I really hope I have some progress to show you soon. Although there hasn’t been much sewing there has been lots of craft. I made a colourful Lego clock, some Scrabble badges and a new fairy garden. I also spent a lovely day at the Museum of Childhood exploring Small Stories: At Home in a Dolls’ House and The Alice Look. My children have also kept me busy and we’ve had fun crafting with coloured sand, painting pebbles to make kid-friendly cactus plants and upcycled plastic Easter eggs to Mad Hatter’s tea cups. We’ve made Miffy biscuits, tried a Miffy paper plate craft and made our own Miffy play dough. We’ve spent hours outside too from making our own flower fairies to building a little mud kitchen. I’ve started buying Pretty Patches magazine too but Mollie Makes is definitely my favourite.